I could care less whether Beyoncé was singing with a real voice or not at the Presidential Inauguration. I care a lot more about whether or not she was wearing real fur. Apparently, yes, she was wearing not only a real fur coat, but real mink eyelashes. Music's hottest couple almost stole the show for themselves when they pitched up to the highly-anticipated event in Washington D.C yesterday morning looking appropriately glamorous in their opulent clothing. Wearing a black floor length gown by Emilio Pucci emblazoned with all-over floral detailing, Beyoncé threw over a knee-length black Christian Dior fur coat and statement emerald earrings to add to the elegant outfit. 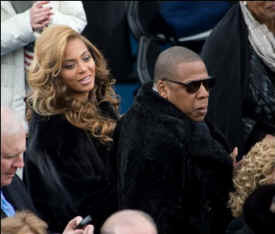 Meanwhile, her rapper husband Jay-Z showed off his ... over-sized fur coat – and looked suave next to Beyoncé. Number one would have to be her fabulous entrance into the Washington DC venue with husband Jay-Z, both wearing utterly fabulous fur coats. Beyoncé's luxe black fur number was from Christian Dior, and boy did she get a few glimpses in it. Beyoncé Knowles doesn’t do anything halfway, and motherhood is no different. Blue Ivy Carter is getting all the spoils of being the Queen B and Jay-Z‘s baby as the mother-daughter duo were seen heading to an office building in New York City’s Midtown on Tuesday with Ivy bundled up in a fur baby sling. Asked by New York Magazine how Beyoncé's eyes are so "beautiful", her makeup artist explained that mink is a "beauty must-have." She really does like liners, and she asks for that a lot, and lashes. And I always use mink lashes on her. They look amazing. I use strips by Velour called "Are Those Real? "and I got her really into it, so she buys them by the ton. There's nothing beautiful about skinning animals (often alive) and taking their coats in an attempt to make yourself beautiful. It only makes you more ugly on the inside.